1. How much time is required? Surprisingly little. Most directors have a faculty member handle the details. Planning and conducting an induction ceremony can be accomplished in two or three hours. NAEHS will provide assistance too. 2. Do the students pay for their memberships? No. If your budget is really tight, most civic groups will sponsor your NAEHS chapter. Contact NAEHS for suggestions on finding a sponsor. 3. Which students are eligible? All adult education students are eligible including literacy, ESL, ABE, GED/HSD. 4. A certificate has a misspelled name or is in some way damaged. Will NAEHS replace it? Yes. Simply return unusable certificates for a replacement. 5. Can I recognize an outstanding student from last year or the years before? Yes. 6. Can I save left-over membership material for next year? Yes. 7. Are there any charter or organizational fees, etc.? 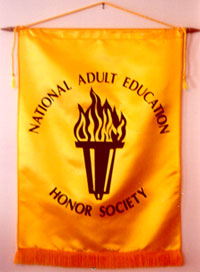 There is a one-time $50.00 charter fee which includes a free banner. 8. Can I get extra membership materials at the last minute? Yes. We will overnite express mail additional materials at cost. 9. How many students should be recognized? That is determined by your program. Some AE programs want recognition to be exclusive and recognize only a few students each year. Most, however, want the recognition to be inclusive and strive to recognize all who meet the standards. 10. Do students take any oaths? No. 11. Can I get references? Contact NAEHS headquarters for a list. 12. How much turn-around time is required before I receive the student membership materials? Please allow 2 weeks after your order is submitted. Rush orders may result in additional postage charges.